We’re starting to fill out our calendar for the upcoming season and are pleased to announce an October performance at 7500 York Cooperative and our annual holiday event at St. Timothy Lutheran in early December! See the calendar for more details. Due to some very busy spring schedules, we’ve decided to cancel our spring concert and push our next public performance into the fall. Check back in the early summer for new dates! Just finished the recording from our 2014-12-20 Winter Concert at St. Timothy Lutheran Church, St. Paul (program). 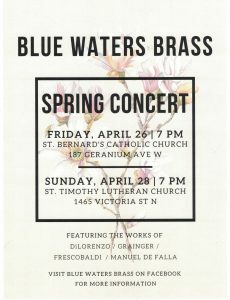 We were joined by a festival choir formed through word of mouth by friends of the Blue Waters Brass (and their friends, too!). Most in the group felt that it was our strongest performance to date and we’re grateful that we had a great group of singers (and organist) to share it with. Enjoy! 2014-04-13 Pops Concert at University Lutheran Church of Hope in Minneapolis (program). 2013-12-15 Holiday Concert at Lutheran Church of the Good Shepherd, Minneapolis (program). Shared with the Lirica Chamber Ensemble with proceeds benefitting the Guyana Lutheran Music Academy. 2013-11-10 Fall Concert at St. Timothy Lutheran Church, St. Paul (program). 2013-03-03 Mid-Winter Concert at St. Timothy Lutheran Church, St. Paul (program).